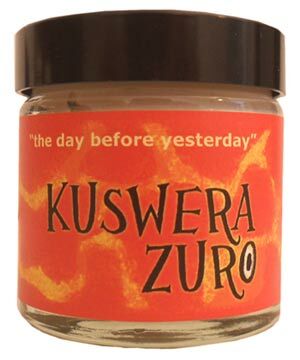 KZ – or Kuswera Zuro, to give it its full name, and meaning ‘the day before yesterday’ – is a soft moisturiser whose key ingredient is African potato tuber, which is rich in anti-inflammatory compounds. It is said to be good for inflamed, swollen or thickened skin, as well as sun-damaged or ageing skin. One of the problem skin conditions it is additionally said to be good for is acne rosacea, and on that basis, we asked two of our regular testers with patches of facial rosacea to try it for a couple of months, to see whether they noticed a difference or improvement. “A little goes a long way with this cream, although it takes a bit more rubbing in than I’m used to as it has a thick consistency. I felt it may be unhygienic constantly dipping your finger into the jar, but I realise that the product may be too thick a consistency for a tube. The informative literature that came with the product was very helpful. The label on the jar is quite busy and bright but feel it’s true to the origins of the product. “A great first impression. KZ comes in a nice glass pot and smelled great; really fresh and fruity. There’s a nice, light, smooth non-greasy feel to the cream. It went on smoothly and sank into my skin easily. I really liked the cream: there seemed to be an honesty about it. I had never heard of using African potato tuber in creams before and was quite excited by the prospect. My skin felt really comfortable after applying the cream and seems to have gained softness after using it regularly. KZ is free from parabens or fragrance allergens. Other than the African potato, there are also some good oils, including wheatgerm, jojoba and evening primrose. However, we would have liked to see the ingredients listed on the website too. A pot retails at £22.50, a not unreasonable price for a product which clearly lasts a very long time. You can buy it from the Little Herbal website. For other products for rosacea, check out our dedicated rosacea directory.